We developed this list of stocks by running our CAN SLIM screener (also available in the Library), filtering out stocks below $2B in market cap, and then eliminating a few more that looked questionable for one reason or another. The basic idea with CAN SLIM is that you find stocks with strong momentum, great growth, and a good story—backed by solid institutional interest and a supportive market context (i.e., a bull market). You attach yourself to these high-flying stocks and then, as summarized by the strategy’s founder, “hop off the elevator on one of the floors on the way up and not ride it back down again.” For full detail on the CAN SLIM strategy, see our blog post on it from earlier this year. Proper execution of the strategy requires qualitative investigation as well as diligence. Here, we’ve not followed the strategy per se, but rather used it as a base to find some under-the-radar picks that have both good technicals (momentum) as well as promising fundamentals (growth). The screener finds stocks with a relative strength index (RSI) of 70 or above; this measures gains to losses in the past 14 trading days (on a scale of 0-100). The high RSI indicates that a stock is experiencing recent price momentum. Price momentum is further established by the screener’s criterion that a stock is at or above 85% of its 52-week high. In addition to the price momentum, these stocks have also cleared the very high earnings growth bar set by the CAN SLIM screener. They each have at least 18% Y/Y growth in quarterly earnings per share (EPS), as well as an average of 25% annual EPS growth over the last 5 years. A quick side note: because of the screener’s high growth criteria, a lot of the passing stocks tend to be small or even micro cap stocks. There is nothing wrong with small cap stocks, but they tend to be riskier and therefore require extra vetting. We have opted to exclude small caps in the interest of making this list more accessible to investors of all levels. The following table includes a sampling of growth metrics. 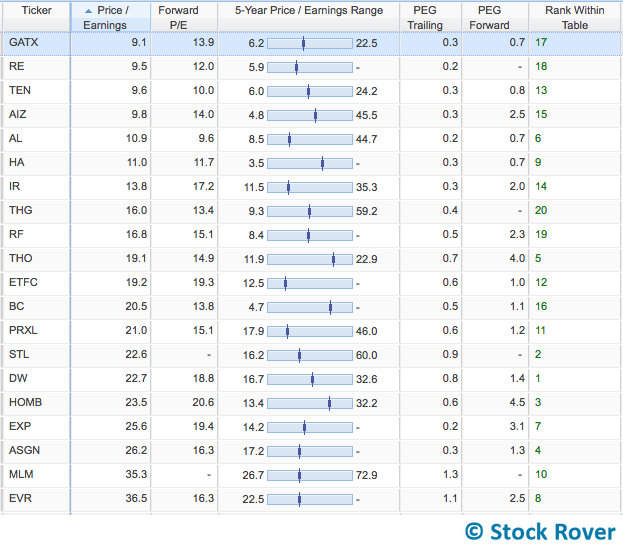 On the whole, these stocks have strong growth not only in EPS (as screened for), but also in sales and operating income. Although a few falter in the 5-year average sales growth column, all of them have double-digit operating income growth. The Growth Ranker used to rank the stocks in the first image incorporates EPS, sales, and operating income as well as expected EPS into its formula. According to that ranking, Drew Industries (DW), Sterling Bancorp (STL), and Home BancShares (HOMB) have the best across-the-board growth. These stocks do indeed look strong in the above table. The estimated next year EPS growth column is a mixed bag, with more than a few stocks expected to decline in this column (including HOMB). While it’s not ideal to see EPS going down, it shouldn’t be a dealbreaker. The drop could be cyclical or due to a one-time earnings event that inflated current EPS. You’ll want to investigate to ensure that the lower expected earnings is not pointing to a larger worrisome trend, like declining sales. Greenblatt’s Return on Capital (ROC) is also included above as well, just as a bonus fundamental datapoint. The Greenblatt ROC is a measure of profitability and is one of just two primary quantitative criteria used in the tried-and-true Magic Formula (which has a completely different philosophy from CAN SLIM). All but two stocks post a positive ROC, and several are outstanding in this metric. For comparison, the median Greenblatt ROC for the Dow Jones Industrial Average is 24.7% and the median for the S&P 500 is 17.1%. One notable omission from CAN SLIM is any mention of price or valuation. This means that in following the strategy you could end up with picks that would make a value investor blanch. Happily, that is not really the case with our watchlist. Although we did not filter on valuation criteria, we did manually weed out stocks that were not even a little bit justifiable from a valuation perspective. William J. O’Neil might not care about price, but we do. 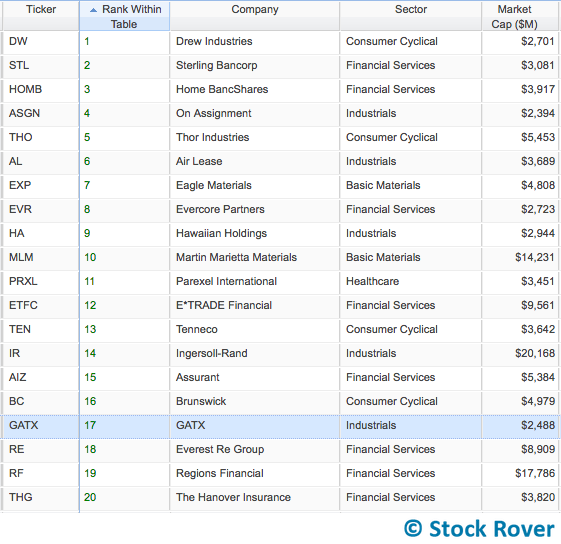 Here is the watchlist again, now with valuation metrics. The stocks are sorted on P/E, and you’ll see there is a real range. The growth ranking from the first table is included here as well (right-most column), for context. Even the priciest pick, Evercore Partners (EVR), starts to look less pricey when you note that its forward P/E is less than half of its current P/E, plus it’s in the lower half of its 5-year P/E range. That’s not to say that it’s cheap, but it does at least provide some sense that it’s not crazily inflated or at a historical high. In fact, most of the stocks are not even close to their 5-year P/E high, and all of the higher priced stocks have forward P/Es that are lower than current P/E. Furthermore, several have PEGs that are at or below 1. This indicates that the valuation is fair or even inexpensive given the stock’s earnings growth. Note the PEG trailing ratio uses historical EPS growth data, while PEG forward uses a 5-year EPS growth estimate. A critical piece of the CAN SLIM framework is the M, which stands for market direction. Basically, you have the best chance of capitalizing on momentum when the market is in an uptrend. And no matter what, it’s always a good idea to have a grasp of the macroeconomic environment before you make investing decisions. So what is happening now? The stock market, as we saw in an earlier image, has definitely been in an uptrend. We don’t know is for how long the uptrend will continue, but there are some signs that the market will continue to perform well. The economy has been growing slowly for a while now, and it is stable enough that the Fed has just raised interest rates, with additional increases predicted for the near future. Furthermore, most of the stocks in our watchlist are in sectors that will benefit or at least not be harmed by an interest rate increase, like Financials, Consumer Cyclical, and Industrials. See our Notes on an Interest Rates Rise article for more on how different sectors are affected by rising rates. Furthermore, although the shifting political environment always creates uncertainty, most of the sectors represented in our watchlist are likely to benefit or at least not be harmed by the Trump Administration, as discussed here. Another factor to consider is that the hot market has led to expensive valuations, as discussed in our earlier article on the market. One possible outcome of this is a price correction (i.e., the market drops), but there is simply no way to know when that would happen, or how quickly. On the other hand, earnings are generally expected to rise, which would help bring valuations down to a fair level without dragging down prices. In any case, it is worth noting that small and mid caps are less inflated than large caps, so they may be better in a position if the expensive valuation chickens do come home to roost. 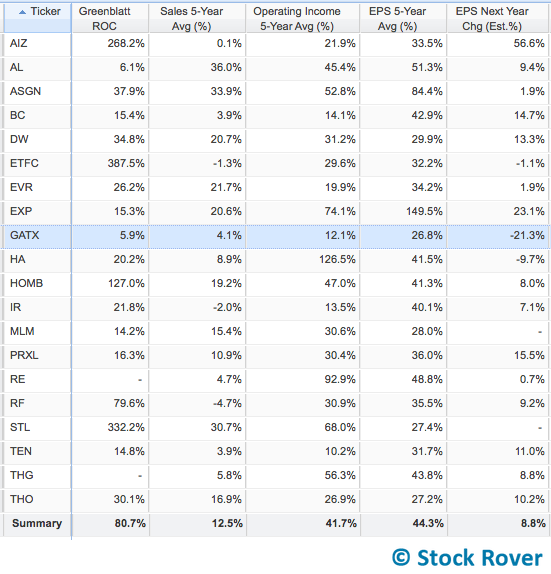 Our Momentum/Growth watchlist mostly contains mid caps. Our CAN SLIM-inspired watchlist gives you 20 stocks for you to sink your teeth into. All of them have a record of very strong earnings growth, and many of them have excellent profitability and sales and operating income growth as well. Additionally, all of them have had recent price momentum. While the combination of growth and momentum means that some of the stocks on the list are considered pricey by the traditional P/E metric, a broader view of valuation shows that their pricing may be more reasonable given historical P/E and expected earnings growth. The changing political context and the interest rate increase adds a dose of macroeconomic uncertainty, but there are reasons to be cautiously optimistic about the current market direction. The market sectors represented on the watchlist, like Financials, Consumer Cyclical, Industrials, and Basic Materials, are expected to benefit in the current macro climate. The Momentum/Growth watchlist, CAN SLIM screener, and Growth Ranker are all available in the Library. As always, we recommend that you do your own research before buying any stocks. We hope this watchlist provides some fresh ideas to get the ball rolling. Really, Really, Good! Well thought out and your timing couldn’t be better. Thanks so much for your kind comment. We’re glad you enjoyed the article. Thanks for being a Stock Rover member!